Your transit guide for the 2018 Vancouver Pride Parade, Celebration of Light and more! The B.C. Day long weekend is a busy one for events across Metro Vancouver, including the annual Vancouver Pride Parade and the Celebration of Light finale. Transit will get you there! Read on for the details. Remember—plan ahead and avoid line ups at Compass Vending Machines by topping up your Compass Card or pre-purchasing your return Compass Ticket. And with Tap to Pay, you can tap your contactless Visa or Mastercard credit card or mobile wallet on Compass fare gates and readers to pay for an adult cash fare! We’re adding extra service and modifying station access in downtown Vancouver to get you to-and-from the festivities smoothly. On bus, there will be extra trips to downtown Vancouver after 6:30 p.m. and additional service after the events. In addition to the usual transit service in the area, beginning at 6 p.m. we’ll operate special buses from Burrard Station (Bay 1) to Robson St & Denman St, and Yaletown–Roundhouse Station (bus stop #50023) to Burrard St & Davie St.
SkyTrain will operate peak service throughout the evening. The SeaBus will operate every 15 minutes until midnight with the last sailing from Waterfront at 1:22 a.m.
West Coast Express will operate a special train on August 4, leaving Mission City at 7 p.m. and arriving at Waterfront Station at 8:15 p.m. The return train departs Waterfront Station at midnight, arriving back at Mission City at approximately 1:15 a.m.
We’re adding extra service on the SkyTrain’s Expo and Millennium Lines to get you into downtown Vancouver for the parade! Trains will run every 2.5 minutes between Columbia and Waterfront stations, and every five minutes for the rest of the Expo Line and Millennium Line. The 5 Robson/Downtown and 6 Davie/Downtown will be detoured to accommodate the parade. For details, visit translink.ca/alerts and follow TransLink on Twitter for up-to-the-minute information. And look for us in the parade walking alongside a 1964 GM New Look “Fishbowl”! It’s a holiday so you’ll only need a one-zone fare to travel across all zones! 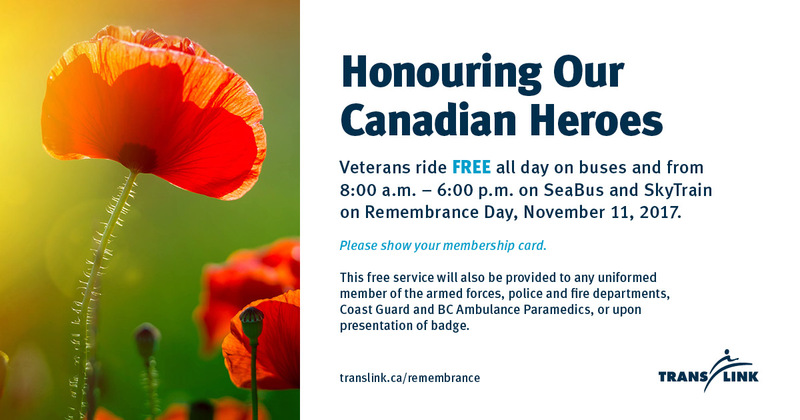 Bus, SkyTrain, and SeaBus services will operate on a Sunday/holiday schedule, and the West Coast Express will not operate. 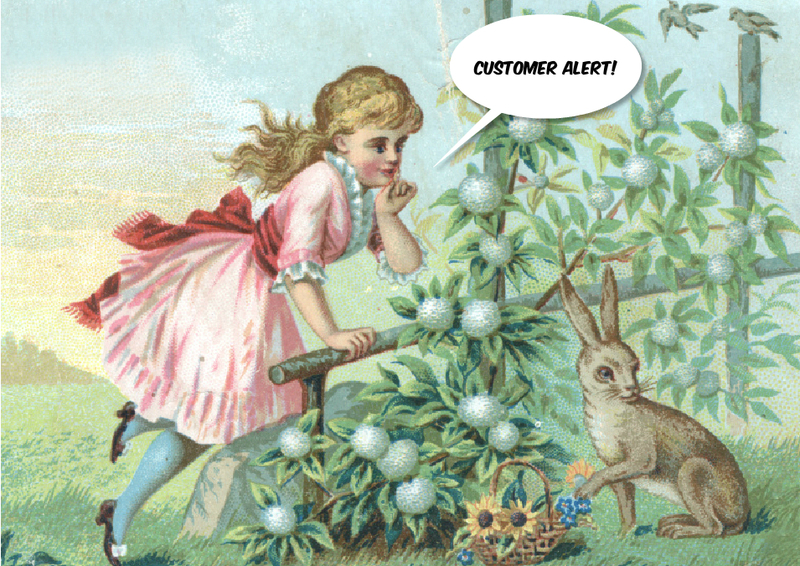 The Compass Customer Service Centre and Lost Property Office will be closed. Service returns to regular weekday schedules for all modes on Tuesday, August 7, 2018. Ride for free this New Year’s Eve! New Year’s Eve brings about many annual traditions. Whether it be watching the iconic NYE ball drop on TV, clanging pots and pans at the stroke of midnight, or watching one of many firework displays. 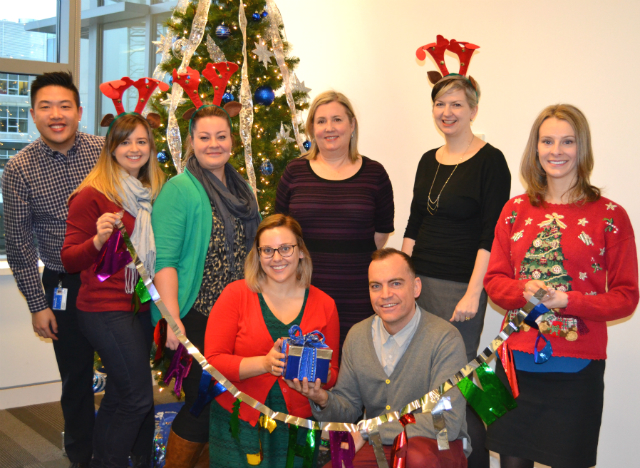 Here at TransLink, our New Year’s Eve tradition dates back 42 years! Free transit is provided for all to ensure everyone in the entire region has access to a safe ride home as we ring in the new year. Your Guide to B.C. Day Holiday Service, Pride, Celebration of Light and more! B.C. day is August 7 and that means a long weekend packed with events and of course, holiday transit service! What’s happening this BC Day long weekend? The Honda Celebration of Light is one of Vancouver’s largest and most well-known festivals, and is recognized as the longest-running offshore fireworks competitions in the world. You can watch Canada put on a magical display of light on Saturday, August 5. For everything you need to know about the Celebration of Light, take a look here and here. Vancouver Pride Week is on to paint the city in rainbows and celebrate the LGBTQ2+ community. The Davie Street Block Party takes place on Friday, August 4 from 6 p.m. until midnight along Davie Street, between Burrard Street and Jervis Street. Starting at 11 a.m., the Sunset Beach Festival happens on Sunday, August 6 at Sunset Beach. One of Vancouver’s most impressive parades, the Pride Parade, takes place on Sunday, August 6 at noon at the corner of Robson Street and Thurlow Street. It proceeds west along Robson Street, then south down Denman Street and finally along Beach Avenue before finishing at Sunset Beach. Look out for us in this historical, 1937 Hayes Anderson in the Pride Parade! The Harmony Arts Festival is a ten day long arts festival that begins this August long weekend on Friday, August 4. The festival is free and takes place in West Vancouver, along the water between Ambleside and John Lawson Park. The festival features live music, free nightly movies and art displays. To learn more, check out the Harmony Arts Festival website. Complete with live music, a torchlight parade, beachside yoga and fireworks, White Rock’s free Sea Festival takes place from 10 a.m. until 10 p.m. on Saturday, August 5 and Sunday, August 6. For a complete list of activities and more information, go to White Rock Sea Festival. There will be added service for the finale of the Celebration of Light on Saturday, August 5. For more information on service changes, take a look here and be sure to check out our Buzzer blog post here for everything you need to know to have a fun and safe time at the Celebration of Light! On Sunday, August 6 SkyTrain will have increased midday service from 8:30 a.m. until approximately 3 p.m. and will then move to the Sunday/Holiday schedule. The Seabus and the Canada Line will operate regular Sunday hours and service. Busses will operate regular Sunday hours and service, however there will be route changes to the 5 Robson and the 6 Davie to accommodate the parade route. On Monday, August 7, Bus, SkyTrain, Canada Line and SeaBus services will operate on a Sunday/Holiday schedule. The West Coast Express will not operate. Transit Tip: Holiday fares will be in effect. You only need a one-zone fare to travel across all zones! Know before you go! 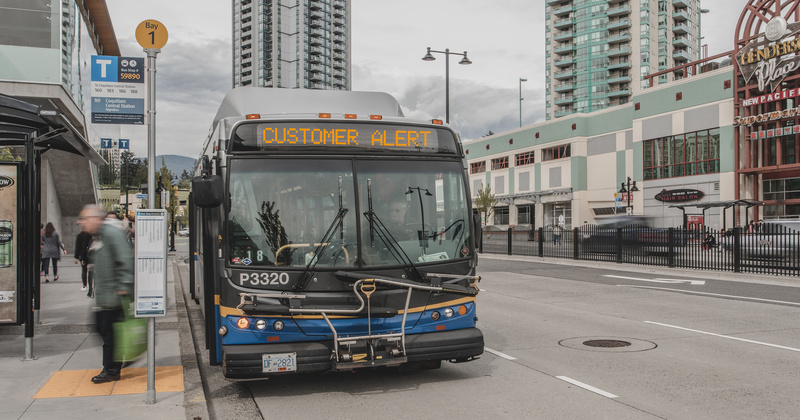 For full detours and maps, visit translink.ca/alerts. Help us plan your transit trip by using Trip Planner. Have questions on the go? 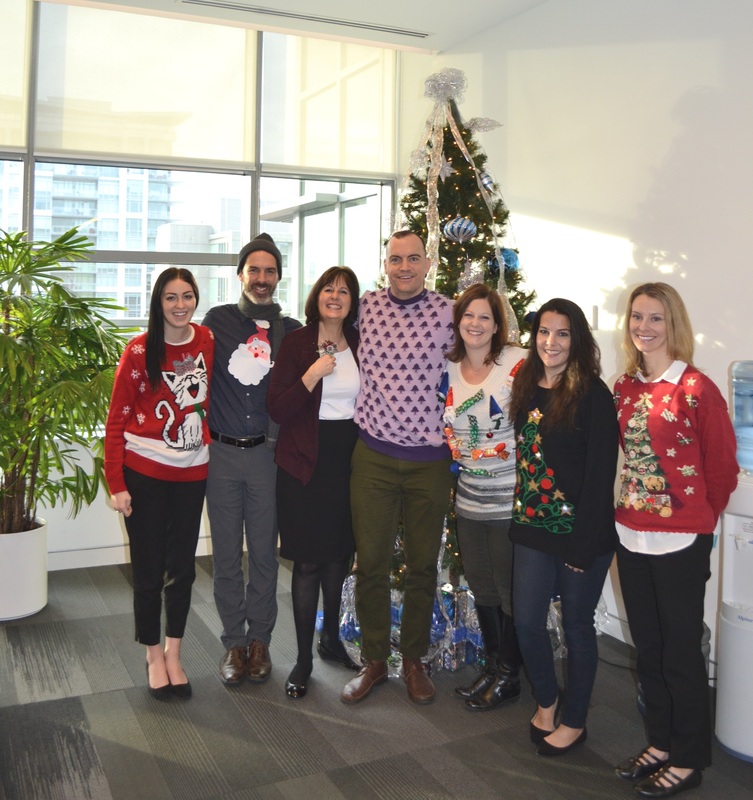 Tweet @TransLink or call us at 604.953.3333. Free transit service on New Year’s Eve! Time for auld lang syne, festive merriment and free transit on New Year’s Eve! That’s right, we’re continuing to provide a safe ride home for the entire region as we ring in 2017. 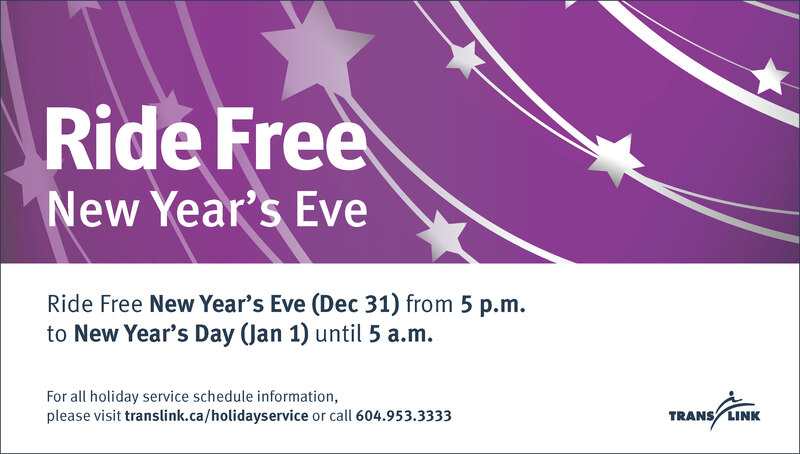 From 5 p.m. December 31, 2016 until 5 a.m. January 1, 2017 there is free service across the entire system! Fare gates will all be open during the free service hours. If you tap in before 5 p.m., you must tap out on SkyTrain and SeaBus to ensure you’re charged the correct fare. Remember! Compass tickets expire at the end of the service day on which they are purchased. Buses will run on their usual Saturday schedules with some routes running additional evening/late-night trips after their normal schedules. **Please note** Bicycles coming into downtown Vancouver may be subject to restrictions on SkyTrain due to crowd conditions at the discretion of the SkyTrain staff on hand. Bikes will not be allowed to board trains at downtown Stations from 11:45 p.m. until the bulk of the crowds have cleared. 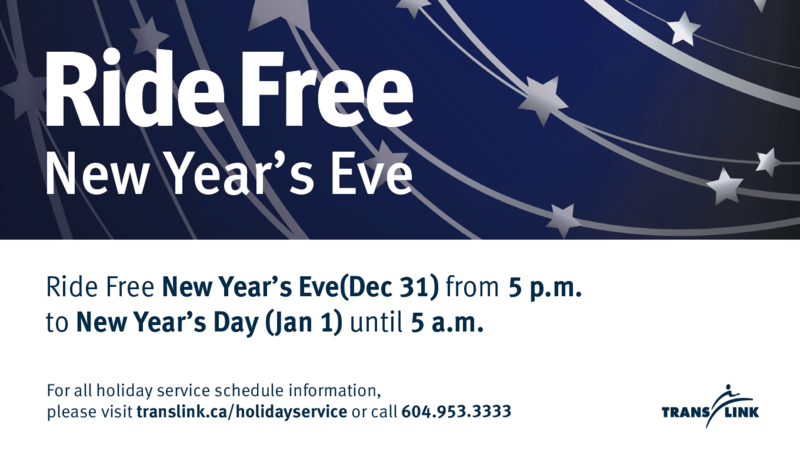 Map out your NYE route with our Trip Planner and head to translink.ca/holidayservice for more information and last run times for buses and SkyTrain. Attention all Boxing Day Metrotown shoppers! We know that you are keen to get a good deal but we also want to make sure you get where you need to go smoothly on Boxing Day. 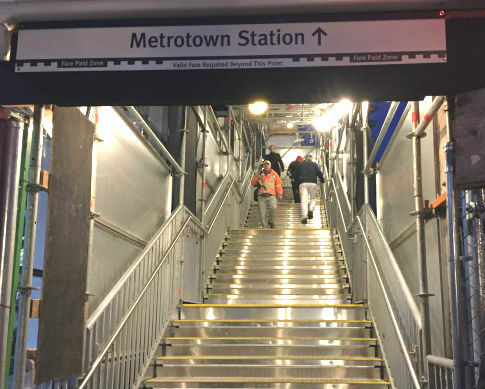 On Monday, December 26, there will be temporary changes to the way you access Metrotown Station. We expect large crowds and we will change pedestrian traffic patterns, depending on the conditions. Customers should plan for additional travel time on the system and out of the station as we expect an influx of thousands of passengers on Boxing Day. You will tap in and out of the station as normally, to ensure you are charged the correct fare. Shuttles will continue to operate as elevator and escalators are out of service. Customers who require the use of an elevator or escalator are strongly encouraged to take the accessible shuttle from Patterson Station. Customers travelling with strollers or large bulky items should take the shuttle from Royal Oak or Patterson stations. Please travel up and down staircases slowly as we expect additional crowding on stairways. 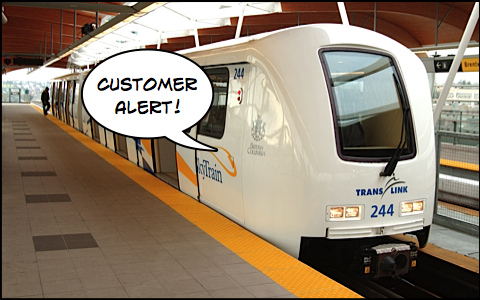 **Please note: Depending on crowding, SkyTrain staff may choose to change pedestrian travel patterns. Four flaggers will be at the crosswalks on Central Boulevard, additional SkyTrain attendants and Transit Police officers will be at the station to help direct customers to the mall and the platform. We understand that this is a busy shopping and travelling day for our customers and we want to make sure the platform is cleared quickly to ensure crowding is kept to a minimum. Have questions about boxing day plan? Tweet us @TransLink and ask away!